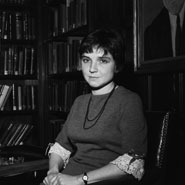 With her highly charged poems about the politics of sexuality, race, gender, and language, Adrienne Rich has been a major force in American poetry for a half-century. Rich's 19 volumes of poetry and three collections of essays have claimed nearly every major literary award, including the 1974 National Book Award for Poetry for Diving into the Wreck and two Guggenheim Fellowships. An advocate for gay and lesbian rights and reproductive freedom, Rich was also involved with in the New Jewish Agenda, a national progressive organization active in various arenas of democracy and civil rights. Her 1976 non-fiction volume Of Woman Born: Motherhood as Experience and Institution is considered a groundbreaking examination of motherhood.